The Beatles 50 Years Ago Today: December 27, 1967. Beatles Radio: The Beatles, Solos, Covers, Birthdays, News The Fab 4 and More! 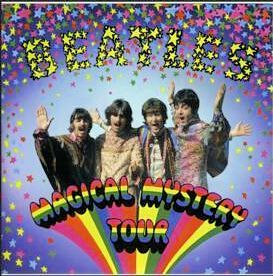 Generally perceived to be The Beatles' first artistic failure, the Magical Mystery Tour film was disliked by critics and viewers alike. In an effort to explain the group's creation, Paul McCartney gave an television interview to David Frost. The interview took place on The Frost Programme, filmed before a studio audience at Associated-Rediffusion's Wembley Studios between 6pm and 7pm, and was broadcast later that evening from 10.30-11.15pm. Frost's conversation with McCartney took up the first half of the show. David Frost: The Beatles' music brings unanimous enthusiasm and approval pretty well. Last night their television show did not bring unanimous enthusiasm and approval, and everyone seems to be discussing it today. Here is the man most responsible, Mr Paul McCartney. Paul McCartney: Good evening, Mr Frost. David Frost: Good evening, Mr McCartney. Why don't you think that the critics liked this film? Paul McCartney: I don't know, you know. They just didn't seem to like it. I quite liked it myself. David Frost: Well, I liked it. I didn't see it last night because I was busy, but I saw it today, and I liked it... I mean, with reservations and so on. But why were people so puzzled by it? Paul McCartney: I think they thought it was 'bitty,' which it was a bit. You know, but it was supposed to be like that. I think a lot of people were looking for a plot, and there wasn't one. David Frost: I saw it in color. That sort of helped, too. Paul McCartney: We thought we could just do a thing... See, we've been waiting for a couple of years now to make another feature film. And we've been asking people to write stories and write plots. But nobody's come up with one, you know. So we thought, 'We'll do something which isn't like that,' which isn't like a real film in as much as it's got a story and a beginning, and we'll just do a selection of, you know... We'd put together a lot of things that we like the look of, and see what happens. I liked it. David Frost: Did you have a point in mind when you, I mean, some point to get across at all when you did this? Paul McCartney: No. See, that's the trouble, seriously. You gotta do everything with a point or an aim, but we tried this one without anything, with no point and no aim. It's like, you know, we make a record album and all the songs don't necessarily have to fit in with each other, you know. They're just a selection of songs. But when you go to make a film, I don't know, you seem to have to have a thread to pull it all together. We thought that doing a mystery tour, you know - it's all happening on a bus to this group of people - would be enough of a thread. And then, calling it a magical mystery tour, which - like a firm advertises a magical mystery tour, and you go on it, and it really is magic - then anything might happen, and it wouldn't have a thread if it was magic. David Frost: What's the difference between what you were trying to do here, and say, if you took an EP - which most people have of Magical Mystery Tour - and played that while looking at a kaleidoscope? David Frost: What's the difference between that and what you did? I mean, was that what you were trying to do? David Frost: Well, now the BBC are going to show it seventeen times. Just sign the thing today. David Frost: Is the fact that it didn't get across to a lot of people, does that fact alter your opinion of it? Do you say, 'Right. It seems to have failed?' Or do you still think it's precisely as good as if people had said it was very good? Paul McCartney: Yeah. I think it's as good as I always thought it was. But when we were making it, I think all of us thought, 'This has got a very thin plot. We hope this idea of doing a thing without a plot works, because the one thing we're gonna be able to say is, it hasn't got a plot.' But yeah. We thought, 'You don't need a plot. You don't always need one.' Because, like, the things you did today probably didn't have much of a plot. David Frost: Oh, I was plotting all day. But no, I can see it. Would you call it a success or a failure today? Paul McCartney: Er, it's both. You know, it's a success failure. You can't say it was a success, you know, 'cause the papers didn't like it. And that seems to be what people read to find out what's a success. But I think it's alright. I think the next one will be a lot better, and it will have a fat plot, as opposed to a thin plot. David Frost: But, I mean, what is success then? How would you define that? Paul McCartney: I don't know. I wouldn't try. I suppose, you know, I don't know how many people liked it who saw it. David Frost: How many people here liked it? Paul McCartney: There's a few, you know. It wasn't much of a success! David Frost: They like you much more than they liked it, you see. But I mean, [to the audience] you better watch it again and again on BBC. David Frost: Can it be a success when people don't like it? Paul McCartney: It obviously matters. If this morning, we'd awoke to find fantastic reviews then we would have all said, 'It's a success.' And I wouldn't have been on tonight, David. But it doesn't matter all that much, 'cause people said about two of our records, like Strawberry Fields and I Am The Walrus to name but two. They said, 'Those are terrible,' you know, 'You can't talk about let your knickers down on telly. You can't do it.' But you can, you know. I've just done it! And it's alright, you know. Because, in about a year or two, these things that didn't look like successes will look a bit more like successes... you know, as people get into that kind of thing.